Epistaxis: What Do People Know and What Do They Do? Aim: The aim of this study is to assess the current knowledge of the first-aid management of epistaxis and misconceptions among the general Saudi population. Methods: A survey questionnaire was developed and was distributed through text message, E-mail, social networks, various websites, and web forums among the Saudi population. Responses were collected over a period of 2 months. Knowledge was assessed based on correct responses to six main questions. Five to six correct answers were considered as excellent knowledge, 3–4 as good knowledge, and 2 and below as poor knowledge. Results: There were 1760 individuals who responded to the survey, 577 (32.8%) were males. There were 828 respondents (47%) who received information on the first-aid management of epistaxis, the most common source of information was through a relative or a friend (15.7%). Only 199 respondents (11.3%) will apply pressure to control epistaxis, 99 (5.6%) knows where to correctly press, and 84 (4.78%) will correctly tilt the head forward. There were 132 respondents (7.5%) who thought that patients should be brought to the ER in all cases of epistaxis. There were 1111 respondents (63.2%) who have poor knowledge of first-aid management of epistaxis. Conclusion: There is poor knowledge of the first-aid management of epistaxis in the surveyed Saudi population. Increased awareness and information dissemination programs on the first-aid management of epistaxis can improve knowledge and recall among the general population. Epistaxis commonly referred to as “nosebleed” remains to be one of the most common ENT emergencies presenting to the accident and emergency departments (AED) worldwide. In the United States, around 1.7% of all AED visits are due to epistaxis, and about 1 in 200 ED visits in the US is due to epistaxis. The incidence usually is bimodal affecting mostly those younger and the older population (<10 years old and >70 years old). Epistaxis that occurs in children younger than 10 years usually is mild and originates in the anterior nose, whereas epistaxis that occurs in individuals older than 50 years is more likely to be severe and to originate posteriorly. However, the incidence of epistaxis declines in adulthood, but approximately one-half of all adults with epistaxis had nosebleeds during childhood. A multitude of causes of epistaxis in children has been reported from nose picking and idiopathic causes, to trauma, medications, nasopharyngeal mass, bacterial nasal colonization, allergic rhinitis, and to the less common cause such as an ectopic intranasal tooth.,,,,,, In adults, recurrent epistaxis is found to be related to trauma, bleeding disorders, and neoplasia apart from the causes mentioned above similar to children. Some studies tried to find association or a cause and effect between epistaxis and hypertension but were not successful. Treatment of epistaxis has undergone significant changes over the years from the uncomfortable posterior nasal pack to the newly developed packing devices, indigenous hemostatic agents, and endoscopic surgical approaches. In most of the cases, epistaxis usually occurs in an out-of-the-hospital setting. Thus, it is very important for nonhealth professional people to understand and to know some first aid measures for epistaxis. Unfortunately, these people have very poor knowledge of first aid measures for epistaxis. A survey conducted among 500 members of the public on how they would deal with a nosebleed revealed that only 50 of 443 responses (11.3%) have the knowledge on how to deal with epistaxis. Other studies also showed very poor knowledge of the first -aid treatment of epistaxis not only in public but also among health professionals. In one survey among health professionals, the most common first aid measures for epistaxis were pinching the nose (94%), nasal packing (80.6%), and sitting leaning forward position (76.1%), and only 38.1% of respondents revealed the correct site for pinching the nose. In the modern digital age, people usually use the Internet as sources of information, particularly YouTube. However, studies showed that many videos on how to manage epistaxis were found to proffer inappropriate and dangerous “alternative” advice. There were very few and recent studies that investigated on how lay people deal with epistaxis when it occurs to them or their family and relatives. For this reason, we conducted this study to assess the current knowledge of the first-aid management of epistaxis and misconceptions among the general Saudi population. We conducted a descriptive study using a survey questionnaire that was developed to address the objectives of the study. The survey tool consisted of questions regarding the demographic profile of the respondents (age, gender, nationality, educational level, and place of residency) and questions on knowledge and sources of information about epistaxis. Identifiers such as name, address, and contact numbers of respondents were not asked to ensure confidentiality and protection of the respondents. The survey tool was setup online using the surveymonkey.com (San Mateo, CA, USA) and was piloted on 10 respondents for clarity, errors, and technical issues before distribution. The actual survey was done by distributing the link to the surveymonkey through text message, E-mail, social networks, various websites, and web forums among the Saudi population along with the consent for participation in the survey/study. Responses were collected over a period of 2 months from September to October 2016. Data collected after the 2 months collection period were downloaded from the survey site as Microsoft Excel 2013 worksheet and was checked for the completeness of data. Correct responses on six questions regarding the first -aid management of epistaxis including applying pressure on the nose, correct area of the nose where to apply pressure, duration of applying pressure, tilting the head, and packing and use of ice packs to control bleeding. Correct responses were given 1 point, and the sum of all responses was obtained. Five to six correct answers of six questions were considered as excellent knowledge, 3–4 as good knowledge, and 2 and below as poor knowledge. Statistical analysis was performed using the IBM Statistical Package for the Social Sciences Software (SPSS) version 23.0 (SPSS Inc., Chicago, IL, USA). Data are presented as numbers, means, and percentages. Chi-square test (χ2) was used for statistical significance between categorical variables and independent t-test for continuous variables. Factors that are correlated with knowledge of the first -aid management of epistaxis was done using the χ2 test and the Pearson correlation test. The value of P ≤ 0.05 was considered as statistically significant. The study complied with all institutional ethical requirements and was approved by the Institutional Review Board of the College of Medicine, King Saud University, Riyadh, Saudi Arabia. There were 1760 individuals who responded to the survey, 577 (32.8%) were male and 1183 (67.2%) were female. Saudis constituted 96.3% of the respondents. There were 586 respondents (33.3%) who were aged 26–35 years old and 442 respondents (25.1%) were aged 19–25 years old. There were 1000 respondents (56.8%) who had a Bachelor's degree in college, and only 14 (0.8%) were not educated. There were 1057 respondents (60.1%) from the Central region. [Table 1] shows the detailed demographic profile of the respondents. There were 828 respondents who claimed that they received information on the first -aid management of epistaxis. The most common sources of information include a relative or friend (15.7%), Internet (14.5%), first-aid course (12.1%), leaflets (11.1%), and television (10.6%) [Table 2]. There were 1386 respondents (78.8%) who have known somebody who had epistaxis. Of these respondents, 683 (49.3%) had received information on the first -aid management of epistaxis. Of the 1386 respondents who claimed that they have known somebody or have witnessed somebody who had epistaxis, 843 (60.8%) tried to stop the bleeding by applying pressure on the nose, 516 (37.2%) applied the pressure on the upper part of the nose, 482 (34.8%) said that they applied pressure for < 5 min, 29 (2.1%) said that they applied pressure for 11–20 min, 307 (22.2%) for 5–10 min, and 10 (0.7%) applied pressure for more than 20 min. 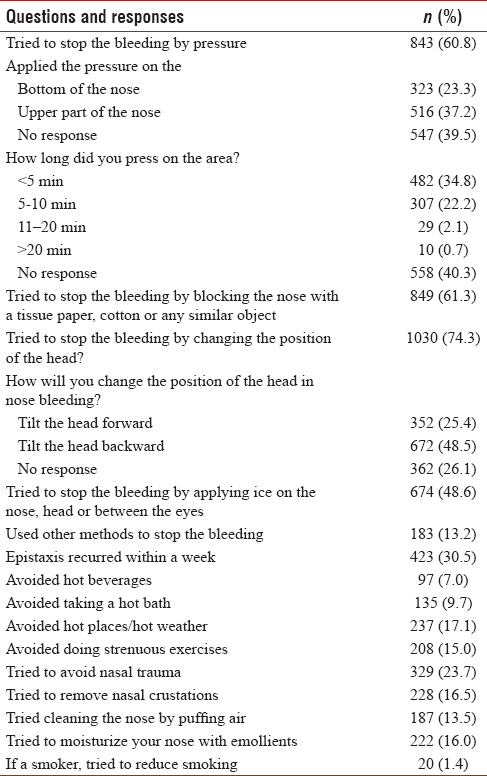 There were 849 respondents (61.3%) who tried to control the bleeding by blocking the nose with a tissue paper, cotton, or any similar object. There were 1030 respondents (74.3%) who tried to stop the bleeding by changing the patient's head position, 672 (48.5%) of which by tilting the head backward. There were 674 respondents (48.6%) who tried to stop the bleeding by applying ice on the nose, head, or between the eyes. There were 423 respondents (30.5%) who claimed that the bleeding (epistaxis) recurred within a week [Table 3]. 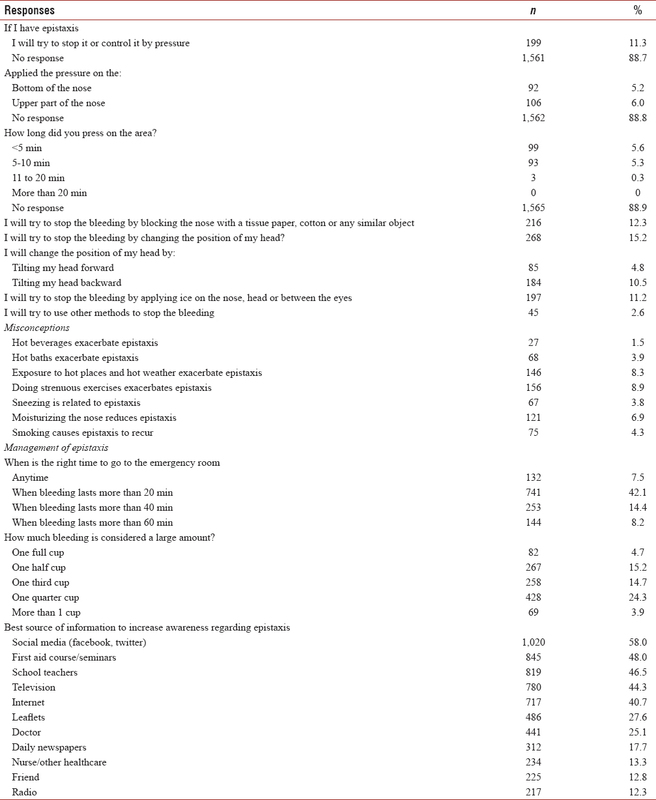 There were 97 respondents (7.0%) who claimed that they avoided hot beverages, 135 respondents (9.7%) avoided taking a hot bath, 237 (17.1%) avoided hot places, 208 (15%) avoided doing strenuous exercises, 329 (23.9%) avoided any trauma to the nose, 228 (16.5%) avoided removing nasal crustations, and 187 (13.5%) avoided cleaning the nose by puffing air. There were 222 respondents (16%) who tried to moisturize their nose with emollients, and 20 (1.4%) tried reducing smoking. Responses to questions when asked what they will do if they will experience or will have epistaxis themselves? When all respondents were asked if in case they will have epistaxis, will they stop it or control it by pressure? Only 199 respondents (11.3%) said that they will stop the bleeding and will control the pressure. One hundred and six respondents said that they will press on the top of the nose, whereas 93 respondents (5.3%) said that they will press at the bottom of the nose. There were 99 respondents (5.6%) who claimed that they will press the nose for > 5 min, and 93 (5.3%) for 5–10 min. Furthermore, there were 216 respondents (12.3%) who said that they will stop the bleeding by blocking the nose with a tissue paper, cotton or any similar object, 268 (15.2%) will try to control the bleeding by changing the head position (184 backward and 84 forward), 197 (11.2%) will control the bleeding by placing ice on the nose, head or between the eyes, and 45 (2.6%) will try using other methods [Table 4]. Among the things that the respondents thought to exacerbate epistaxis include the following; drinking hot beverages (1.5%), hot baths (3.9%), exposure to hot places and hot weather (8.3%), strenuous exercises (8.9%), sneezing (3.8%), and smoking (4.3%). There were 121 respondents (6.9%) who thought that moisturizing the nose reduces the risk for epistaxis. There were 132 respondents (7.5%) who thought that patients should be brought to the ER in all cases of epistaxis irregardless of the duration of nosebleed, whereas 741 (42.1%) thought that patients should be brought to the ER when epistaxis lasts more than 20 min. Around 428 (24.3%) of respondents thought that one-quarter cup of blood constitutes a heavy bleeding. When respondents were asked about which platform would best serve to increase awareness of epistaxis, and which of the platform would reach them more effectively, 1020 respondents (58%) said social media such as facebook and twitter, 915 (52%) through first aid seminars and conferences, followed by teachers (n = 819, 46.5%) and television (n = 780, 44.3%). [Table 4] shows the responses of all the respondents on what are their measures and first -aid treatment when they will have epistaxis themselves. Of the 1760 respondents, only 94 (5.3%) scored excellent in the knowledge of first -aid management of epistaxis, 555 respondents (31.5%) had good knowledge and 1111 respondents (63.2%) had poor knowledge of first -aid management of epistaxis. The gender distribution of levels of knowledge of the first -aid management of epistaxis is shown in [Table 5]. Knowledge is significantly correlated to “received information on first -aid management of epistaxis” (r = 0.126, P < 0.001) and “knew someone managed of epistaxis” (r = 0.342, P < 0.001). Age, gender, nationality, place of residence, and educational level are not correlated to knowledge of first -aid management of epistaxis (P = 0.069, P = 0.787, P = 0.444, P = 0.653, and P = 0.095, respectively). Logistic regression analysis of significant factors that affect the knowledge of the first -aid management of epistaxis revealed “having received information on the first -aid management of epistaxis” and “having known someone with epistaxis” as the most significant factors (beta = 0.101; t = 4.459; P < 0.001, and beta = 0.336; t = 14.982, P < 0.001, respectively). To the best of our knowledge, this is the first study that investigated on the knowledge and misconceptions on the first-aid management of epistaxis in Saudi Arabia. The study confirms that the general public of Saudi Arabia has poor knowledge on the first-aid management of epistaxis. The study results showed that 63.2% of the surveyed population had poor knowledge on the first-aid management of epistaxis. The study results fared better compared to a similar study conducted by Strachan and England in 1997, in which they found that 88.7% of their surveyed population has poor knowledge on the first-aid management of epistaxis. However, the Strachan's study  was conducted among patients who were attending the ENT department; our study was conducted on the general population, particularly on patients who were not attending any ENT consultation during the time of the survey, which would reflect a more valid result on the surveyed population, i.e. the general public. Another possible explanation for this is the significant advancement in technology and telecommunication methods and the easy access to information nowadays through the Internet and the different social media. Another highlight of this study is that 828 respondents (47%) have received information on the first-aid management of epistaxis, and around 78.8% have known somebody who had epistaxis. However, there were 475 respondents (57.4%) who still have poor knowledge of the first-aid management of epistaxis and were able to answer 1 or 2 questions correctly indicating poor recall of any information about epistaxis or probably even misinformation about the first-aid management of epistaxis. Many of these respondents (n = 286, 30.9%) got their information on epistaxis through the Internet. 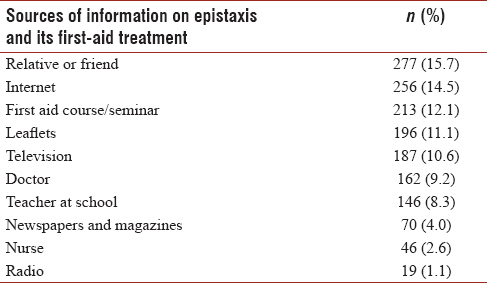 With the multitude of websites in the Internet that proffer management advises on epistaxis, many of these Internet sites may not be very useful and sometimes, inappropriate for the management of epistaxis. This has been explained by Mugwe in 2014, wherein several Internet sites, particularly in YouTube suggests medical advice on how to manage epistaxis, but most of these sites are unreliable and are not evidence based. Furthermore, it was found that recall with these procedures (first-aid management of epistaxis) has been found to be very low among health practitioners, what more with ordinary individuals who are not health practitioners? This probably explains why despite the information that our respondents have received, there were still a significant number of respondents who scored poor and very low on the questions regarding management of epistaxis. Among the respondents who have witnessed somebody with epistaxis, 60.8% claimed that they tried to stop the bleeding by applying pressure. However, when they were asked if they (themselves) will have epistaxis, only 11.3% said that they will stop the bleeding by applying pressure. Furthermore, 22.2% of those who witnessed somebody with epistaxis said that they applied the pressure correctly for 5–10 min. In contrast, only 5.3% will apply pressure on their nose for 5–10 min when they (themselves) will have epistaxis. The disparity in the percentages in the responses to questions between what they have observed and what they will do when they (themselves) will have epistaxis holds through with other questions. Percentages of correct responses were lower when they will have epistaxis themselves compared to when they observed what is done to somebody with epistaxis. The explanation is very clear. Respondents do not actually know or much more, not sure whether what they have observed what is being done to somebody who has epistaxis is “correct” or does not know/is not sure of what is the correct approach to management for epistaxis if they will have it themselves. There were also a few of our respondents who thought that hot beverages, hot bath and hot weather can intensify nosebleeds. The explanation for these changes in humidity and temperature have an effect on the capillaries in the nose, particularly vasodilation which increases blood flow through all capillaries, including the nose, increasing the chance for a bleed, and also the mucous membranes of the nose becomes more sensitive to changes in humidity and weather (also in cold weather, nosebleeds are also very common). Information on these other factors that can increase the likelihood of a nosebleed such as changes in the weather may not be tackled that often during a doctor–patient conversation, and much less often in conversations among friends, relatives who are not health practitioners or even health-related workers. Another highlight of this study is, around 7.5% of our respondents thought that patients should be brought to the ER in all cases regardless of the duration of the nosebleed, and around 42.1% claimed that patients who bleed for more than 20 min should be brought to the ER. The knowledge of patients on when to go to the ER and have themselves treated for epistaxis is important because it can save them time and effort of rushing to the hospital when in fact they can simply manage epistaxis through simple and basic steps at home, unless they are the so-called “blood thinners” (patients who are taking medicines such as warfarin, clopidogrel, and/or aspirin). Moreover, an increase in the knowledge of first-aid management of epistaxis will greatly reduce the congestion in the ER, particularly in cold and hot weather and eventually, save on the economics aspect of health care. Overall, the general knowledge of our respondents on the first-aid management of epistaxis is low, even though some of them claimed to have witnessed how epistaxis was managed. However, having witnessed someone being managed for epistaxis and having received formal training or information on the first-aid management of epistaxis are factors that can significantly improve their level of knowledge. This study showed that the level of education, gender and age may not significantly improve the knowledge of the first-aid management of epistaxis. First-aid management of epistaxis is more of a procedure that can be done at home. The procedure actually does not need someone to be highly educated, or be young to do it properly. All it needs is proper training and instruction on how to do it properly. Simple rationalization of why we have to press on that particular area of the nose, for how long makes a lot of difference. The limitation of this study is its descriptive nature. Since we have conducted this study in a survey format, we were not able to assess the authenticity of the responses and not just mere “guesses” made by the respondents. However, being the first study to describe how the lay individuals think, know, and what they do in cases of epistaxis, the results of this study can serve as a background for further studies that can be conducted in this matter. Furthermore, the results of this study reflect how the “ordinary” people who are not medically inclined perceive and think of epistaxis. For local authorities and administrators of health institutions, the highlights of this study can serve as a basis for the implementation of information campaigns, workshops, training, and seminars to increase the knowledge of the general population on the first-aid management of epistaxis. In the long run, there will be great ease in the burden of health economics and future planning, and will definitely decrease the morbidity of epistaxis. There is a high percentage of poor knowledge of the first-aid management of epistaxis in the Saudi population. Healthcare institutions, health administrators together with the healthcare authorities of the general population, should work hand in hand to increase not only awareness and knowledge among those who have received information of epistaxis but also enhance recall and retention of the first-aid management of epistaxis. This, in turn, will decrease the morbidity of epistaxis and will be a very big help to the economic planning and aspects of the healthcare industry. Pallin DJ, Chng YM, McKay MP, Emond JA, Pelletier AJ, Camargo CA Jr., et al. Epidemiology of epistaxis in US emergency departments, 1992 to 2001. Ann Emerg Med 2005;46:77-81. Bernius M, Perlin D. Pediatric ear, nose, and throat emergencies. Pediatr Clin North Am 2006;53:195-214. Paranjothy S, Fone D, Mann M, Dunstan F, Evans E, Tomkinson A, et al. The incidence and aetiology of epistaxis in infants: A population-based study. Arch Dis Child 2009;94:421-4. Burton MJ, Dorée CJ. Interventions for recurrent idiopathic epistaxis (nosebleeds) in children. Cochrane Database Syst Rev 2004;(1):CD004461. Brown NJ, Berkowitz RG. Epistaxis in healthy children requiring hospital admission. Int J Pediatr Otorhinolaryngol 2004;68:1181-4. Bilgen C, Karci B, Uluöz U. A nasopharyngeal mass: Leech in the nasopharynx. Int J Pediatr Otorhinolaryngol 2002;64:73-6. Whymark AD, Crampsey DP, Fraser L, Moore P, Williams C, Kubba H, et al. Childhood epistaxis and nasal colonization with Staphylococcus aureus. Otolaryngol Head Neck Surg 2008;138:307-10. Schlosser RJ. Clinical practice. Epistaxis. N Engl J Med 2009;360:784-9. Douglas R, Wormald PJ. Update on epistaxis. Curr Opin Otolaryngol Head Neck Surg 2007;15:180-3. Verma RK, Bakshi J, Panda NK. Ectopic intranasal tooth: An unusual cause of epistaxis in a child. Ear Nose Throat J 2012;91:242-4. Gifford TO, Orlandi RR. Epistaxis. Otolaryngol Clin North Am 2008;41:525-36, viii. Sarhan NA, Algamal AM. Relationship between epistaxis and hypertension: A cause and effect or coincidence? J Saudi Heart Assoc 2015;27:79-84. Lavy JA, Koay CB. First aid treatment of epistaxis – Are the patients well informed? J Accid Emerg Med 1996;13:193-5. Strachan D, England J. First-aid treatment of epistaxis – Confirmation of widespread ignorance. Postgrad Med J 1998;74:113-4. Middleton PM. Epistaxis. Emerg Med Australas 2004;16:428-40. Mugwe P, Kamau KJ, Nyambaka OK. Knowledge, attitude and practice in first aid management of epistaxis by accident and emergency clinical staff at Kenyatta national hospital. East Cent Afr J Surg 2014;19:17-21. Haymes AT, Harries V. 'How to stop a nosebleed': An assessment of the quality of epistaxis treatment advice on youTube. J Laryngol Otol 2016;130:749-54.